What's in a Doctor's Bag? RX Humor is a publisher of children's books. 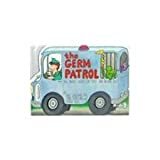 Some of the books published by RX Humor include The Germ Patrol: All About Shots for Tots...... and Big Kids, Too!, What's in a Doctor's Bag?, 101 Ways to Know If You're a Cna.